The Freedom From Religion Foundation has ended a recurring constitutional violation at an Illinois high school’s athletic events. 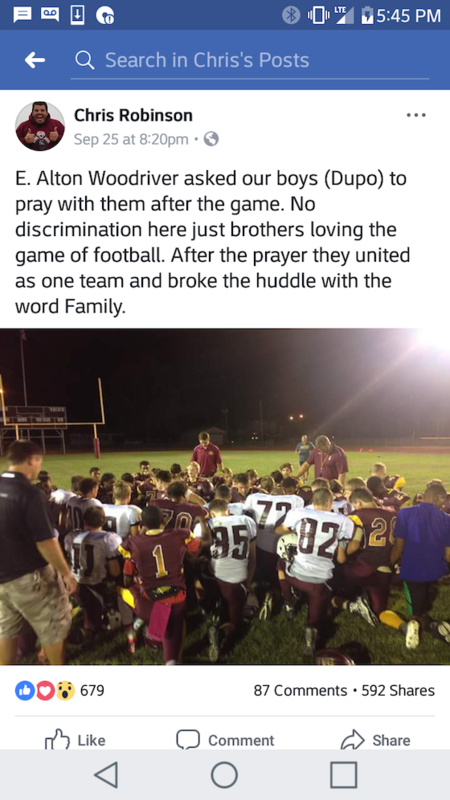 A local resident contacted FFRF to report that football coaches at East Alton-Wood River High School, in Wood River, Ill., were regularly participating in prayers with their students. A Facebook post from this past September pictured several coaches praying during a football game with players from both East Alton-Wood River and Dupo high schools with the caption, “E. Alton Woodriver asked our boys (Dupo) to pray with them after the game.” The photograph shows coaches with their heads bowed, placing their hands on students who are kneeling in prayer. FFRF wrote to East Alton-Wood River Superintendent John Pearson warning the school district that it is illegal for public school athletic coaches to lead their teams in prayer, participate in student prayers or to otherwise promote religion to students. Time and again, the U.S. Supreme Court has struck down school-sponsored prayer. And when public school employees acting in their official capacities organize and advocate for team prayer, they endorse religion on the district’s behalf, FFRF contended. FFRF requested that the district commence an immediate investigation and take action to ensure that the high school’s football coaches stop praying with students during future district athletic programs. Pearson responded on Jan. 19 informing FFRF that the coaching staff would be told that participating in prayer with players is a constitutional violation. FFRF is saluting district officials for doing the right thing. “They’ve saved themselves a lot of future trouble and protected their students’ rights of conscience from religious coercion,” says FFRF Co-President Annie Laurie Gaylor. The Freedom From Religion Foundation is a national nonprofit organization with about 30,000 members and chapters across the country, including more than 950 members in Illinois and the FFRF Metropolitan Chicago Chapter. FFRF’s purposes are to protect the constitutional principle of separation between state and church, and to educate the public on matters relating to nontheism.